Tomorrow is the start of Match Week 2017. Across the country fourth years will be anxiously awaiting an email stating either “Congratulations You Matched” or… not. Today, those same medical students are quietly freaking out. That’s okay, and it’s normal. But my mother always told me that “worrying is paying interest on money you haven’t borrowed,” so let’s turn that stomach-churning madness into action. First, go review the SOAP site. 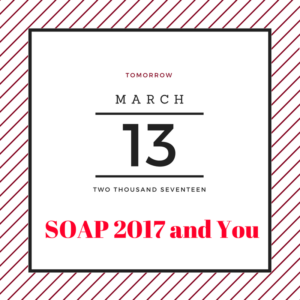 It outlines how a SOAP round works, provides the SOAP week schedule and has a decent FAQ. Information is power, and having it will make you feel better. Second, if you get an unfortunate email tomorrow you need a plan, not panic. While I didn’t have to SOAP last year, I did plan for it. Yes, the effort was wasted, but I felt better being prepared for the worst. You need to have access to a computer, with WIFI that’s reliable. If you don’t have an account, setup Skype on your computer today. Figure out how to FaceTime if you’ve never done so before. Find out how your school will help you – especially if you’re on an away rotation. There are likely several emails about this from your school sent out in the past few weeks. Check your spam. Third, chill out. The above was my only preparation, and then I just enjoyed the rest of the day. Yes, there was anxious texting between friends, and yes, I read every sentence on the SOAP site. But once I’d made my preparations and done the reading there was nothing else to do. So go and enjoy the rest of the afternoon.